← Understand the ROI of Social Media – People Aren’t Just Talking to their neighbors and the folks they run into around town; They’re Talking to the World via Social Media. Like a great story that just keeps unfolding, the numbers toward business growth are impressive: To date, more than 495 entrepreneurs have been assisted with business facilitation, touching six northwest Missouri counties. Nearly 1,500 personal introductions to the initiative have been created for people in the community and by word of mouth. The main character here is Northwest Missouri Enterprise Facilitation (NWMEF), a nonprofit organization based in Savannah, Mo., that brings the knowledge, connections and expertise of more than 60 volunteers from the region to budding entrepreneurs and existing area businesses. The goal is to help businesses in six rural counties to launch or expand their business ventures, akin to an old-fashioned “barn raising” that helps strengthen and sustain the region, according to NWMEF. The desire to see the lush, gentle hills and neighborly feel of the region also serve as a vibrant hub for economic growth has been present for decades, although actual economic strength was on a gradual decline. Drawing on this challenge, Dr. Ernesto Sirolli, economist, helped create this unique neighbor-to-neighbor philosophy toward revitalizing the region through economic development strategies that are officially named Enterprise Facilitation. The goals and efforts of NWMEF are directed by a large and experienced board of more than 50 business and community leaders across six counties, and since 2006, have followed the ideas and direction of the Sirolli Institute through an apprenticeship program. Extensive training is offered to board members as the group continues to grow. Businesses who have worked with NWMEF have been encouraged by the Enterprise Facilitator to create a specific team to help the organization reach its goals. The Facilitator is trained in ways to evaluate each client’s skill level, strengths and weaknesses as business next-steps unfold. Services are available at no cost to the businesses who participate. The list of businesses who have tapped into the unique philosophy and format of the Enterprise Facilitation initiative are diverse, ranging from audio visual installation services, local eateries and a bakery, a counseling center, a childcare center, a photography studio and air conditioning service – among many others. Special groups, such as a restaurant group, allow local organizations to connect with peers and talk about challenges and successes first-hand. Using social media tools and news updates, NWMEF is capturing and promoting the entrepreneurial spirit of organizations across the six-county region, and turning this energy into economic growth. 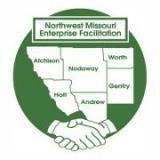 Today, we say thank you to Northwest Missouri Enterprise Facilitation for creating a stronger region, based upon what’s unique, inviting and amazing about the people and businesses in the area. Although it’s much more modern than Mayberry, this is bound to be a classic tale of small-town success meets big-city knowledge for years to come. This entry was posted in Consistent Customer Communications, Content Marketing, Copywriting, Monday Morning Coffee, Nonprofit Marketing, Success Stories, Support Local, Teamwork and tagged coffee, coffee talk, copywriting solutions, Dr. Ernesto Sirolli, entrepreneurial spirit, Mayberry, Northwest Missouri counties, Northwest Missouri Enterprise Facilitation, NWMEF, relationships, Susan J. Campbell Copywriting Solutions. Bookmark the permalink.